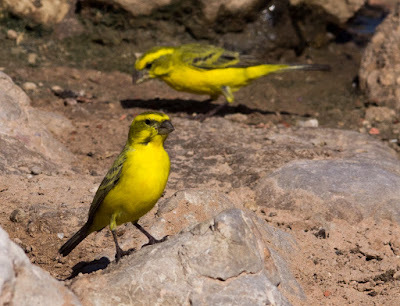 Yellow canaries Serinus flaviventris, copyright Jaffles. Contains: Drepaninini, Carpodacus, Pyrrhula, Loxia, Acanthis, Carduelis, Serinus, Spinus, Chloris. The Carduelinae are a group of finches found in Eurasia, Africa and the Americas. They have upper bills that are generally distinctly longer than the lower bill, and a well-developed crop that is used to store food. Nestlings are fed on regurgitated seeds rather than on insects. [SA82] Sibley, C. G., & J. E. Ahlquist. 1982. The relationships of the Hawaiian honeycreepers (Drepaninini) as indicated by DNA-DNA hybridization. Auk 99: 130–140.